Advertised by Time Magazine as one of the world's Top 10 Most Precarious Buildings, the Hanging Temple (Xuan Kong Si) is another one of Datong's 1,500-year-old treasures and one of the most photographed sights of Northern China. 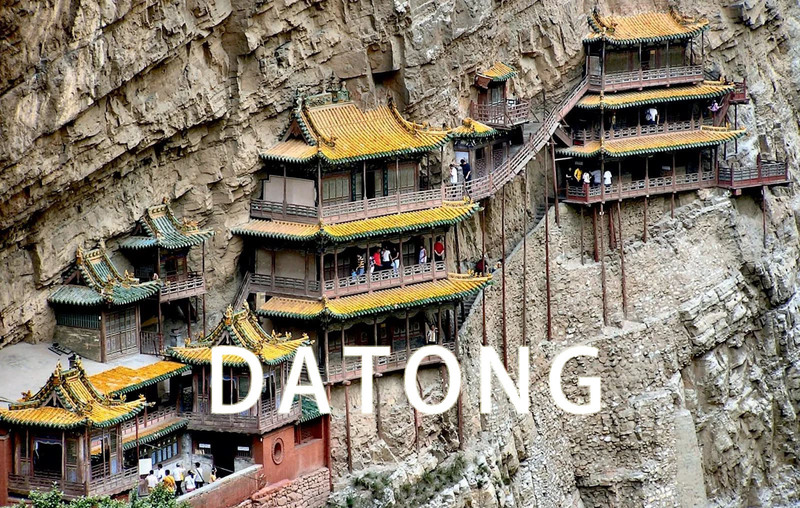 This is an absolutely breathtaking spectacle that every visitor to Datong should see, though perhaps not everyone could summon the courage to enter. Constructed at roughly the same time as the Yungang Grottoes, the Hanging Temple is a brilliant piece of medieval engineering from the 5th Century. To the awed observer underneath, the temple seems to be supported dangerously by a few lanky wooden poles jabbed vertically into the already near-vertical cliff side. If you still can't imagine, think of an apple pie fastened to the side of your fridge by a few toothpicks underneath. Except the toothpick-thin support was a rather late addition only 600 years ago, and could be removed entirely without throwing the temple and its army of tourists down the treacherous cliff. Ancient engineers ingeniously reinforced the structure through a system of crossbeams inserted right into the rock face, safely securing it against earthquakes and cliff erosion for the past millennium and a half. Even Li Bai, China's most famous poet, gave his approval over a thousand years ago with an oversized work of calligraphy that is now engraved at the bottom of the cliff. For entrance fees as steep as the drop under foot (RMB 130 for a crowded 20-minute walk! ), visitors get the chance to confront their own worst feelings of vertigo inside the small wooden temple with the vertical rock face on one side and a heart-stopping plunge to the valley floor on the other. I've been to another so-called Top 10 Most Precarious Building at Meteora, Greece, and this one was definitely scarier. It's actually not as intimidating as it sounds -- you just have to turn off your intellect and stop questioning China's safety standards on the wooden planks and railings, and at the same time hope that the lady at the entrance doesn't let too many zealous tourists enter the structure at once. There is no turning back once you enter, as the route is marked out in a one-way loop of the multi-level temple. Backtracking would be even more dangerous as you would need to squeeze past the oncoming queue along the precariously low railings. What happened in Mount Kailash? Kuche Canyon among Tianshan Mountains.